If you think Skype is a great way to connect with long distance friends and feel like you’re in the same room, wait until you see what Room2Room can do. The new technology from Microsoft Research will be able to project a life-size version of a person into a room with you. 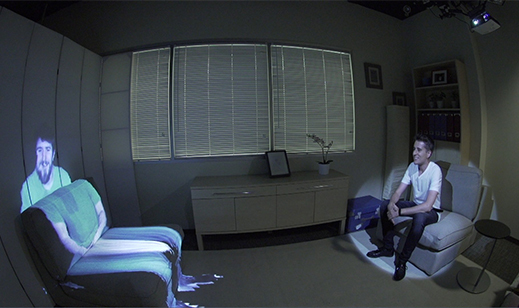 Researchers took advantage of an existing Microsoft Research augmented-reality project called RoomAlive, which uses Kinect depth-sensing cameras and digital projectors to create a room-sized augmented-reality gaming area. In this situation, though, two rooms were set up with the hardware, so they could scan a person sitting in one room, and project him into the other. Each person can then see a digital image of the other with the correct viewpoint and interact accordingly. Room2Room places the projected image of a person into an open space, like a chair if the person is captured in a seated position, as seen above. Researchers wanted to learn whether communicating through augmented reality could be as effective as in-person communication. To test this, they gathered seven pairs of study participants and had them build three-dimensional shapes with blocks via augmented reality. One person from each pair sat in front of a table in one room with blocks, while their partner sat in another room, giving instructions for what kind of shape to construct. Each person was projected into the other’s room so they could work together. When doing the puzzle in person, teams were finished in about four minutes. The results showed that partners took longer to complete the puzzle when using the augmented-reality system, about three minutes longer. However, doing the same puzzle using Skype video chat took nine minutes. It does seem that the augmented reality system would be an improvement over other communication technologies in place now, but wouldn’t rival the effectiveness of face-to-face communication. But in any case, before the Room2Room is on the market, there are plenty of issues that need to be solved. For example, the hardware needed for the projection is difficult to set up. You know how, when using Skype, the image can freeze or become pixelated when there are internet issues? Well, the Room2Room doesn’t produce very high-resolution images either, according to Tomislav Pejsa, who worked on Room2Room while an intern at Microsoft Research. This makes it difficult to tell where a projected person’s gaze is aimed, which can largely affect non-verbal communication. Tobias Höllerer, a professor at the University of California, Santa Barbara, who studies augmented reality, says the resolution could easily be improved, and expects we will be using systems similar to Room2Room in the coming years.